Giving over half of your work away for free is just business as usual. How do you write a business model for an impact-driven business? What tools are out there to properly scope a pro-bono project and plan for success? What kind of agreements do practitioners need to have in writing with their pro-bono benefactors? Through a series of worksheets and activities, Part 3 of the “How to Give Half of Your Work Away for Free” toolkit will enlighten readers on best practices for undertaking a pro-bono project. We invite you to write in the book, or scan and print the worksheets to complete with your team. 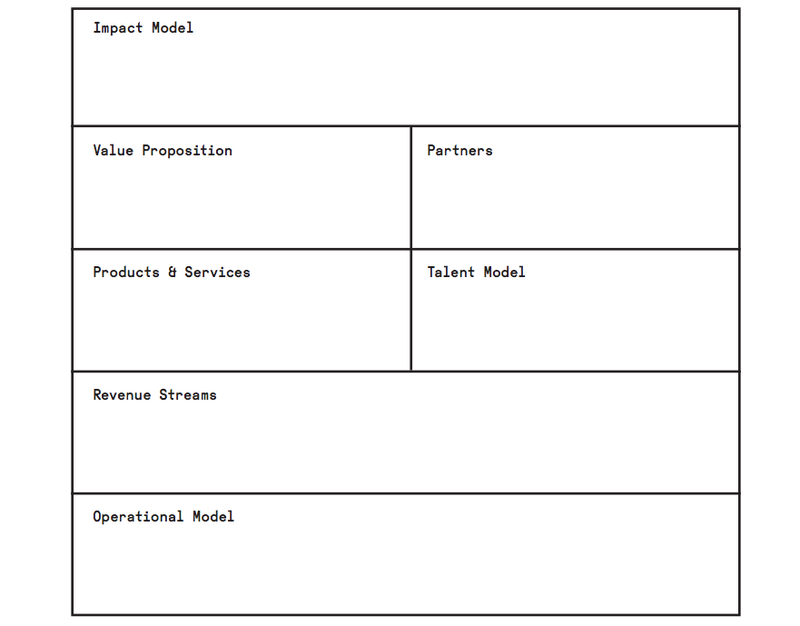 The following diagram is an adaptation of the Business Model Canvas, a strategic management and entrepreneurial tool that was developed as part of the Business Model Generation project. The Business Model Generation project aims to allow entrepreneurs to describe, design, challenge, invent, and pivot their business model. Through a collaborative effort at the LEAP symposium in 2013, a 3 day intensive workshop held at Art Center College of Design, a small group of industry leaders in the space of social impact worked together to co-design a more specific version of the Business Model Canvas that is designed for organizations and businesses that have social impact at the core of their vision. This tool was co-created by Matthew Manos of verynice, Jocelyn Wyatt of IDEO.org, Bob McKinnon of GALEWiLL Design, Elaine Asal of Gensler, Nathalie Destandau of Tomorrow Partners, and Zach Hendershot of CauseLabs. The following is an example of the canvas populated with the verynice business model as a case study to build upon. We encourage our readers to populate their own canvas and revisit the tool frequently so as to keep track of your progress and, most importantly, your weaknesses. 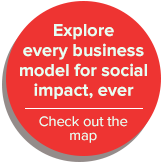 Impact Model: How does social impact fit into your organization? How do you measure your social impact? verynice does not create social impact, but our clients and partners do. Our role in the facilitation of social impact is the design of a model that alleviates expenses that can, as a result, be re-invested into the organization itself. In order to measure the impact of our organization, we compare the scopes of our pro-bono projects to the rates of our paid work and define a figure per each volunteer project that represents the estimated value / financial equivalent in order to measure the dollar amount that the organization can then, in turn, re-invest into their organization. We frequently revisit the equivalent rates for our previous projects to keep our gross donation measurement up to date with our most recent set of rates. Aside from financial measurement, we also catalog approximate hours that have been contributed to each project. To date we have created a measurable impact of the equivalent of over $1,000,000 in pro-bono services donated and re-invested into non-profit impact along with over 50,000 total volunteer hours as a studio. Value Proposition: What makes your organization and offer unique? How are you really making impact? verynice is the leader in small business philanthropy. We are pioneers of a necessary model that will allow organizations to save resources that create impact. We are creating impact by making it easier for our non-profit clientele to focus their resources on their cause. Thanks to operating under a model that calls for a balance of for-profit and non-profit clientele, we are in a unique position to help businesses think more like a non-profit would in regards to social impact and ethical practices while simultaneously help non-profits think more like a business would in regards to organizational sustainability and strategic planning. Partners: Who do you work with to have social impact? Who won’t you work with? Who are your clients, funders, and networks? Products & Services: What are you creating? What happens beyond your role? verynice’s products and services encompass the design of Business Models, Interactive Experiences, Branding, Strategic Planning, Product Development. verynice is a generalist design firm. We do things that require strategy and innovation. Upon completion of a project, we create long-term implementation plans and strategic guidelines for our clients to adhere to. Talent Model: Who does the social impact work? How do you engage them? What do you owe to your team? verynice’s core and remote team is comprised of 2 business owners / partners, 2 managers, 6 part-time designers & strategists, 250+ contractors / freelancers / volunteers. We engage the majority of our team on a per-project basis, and create a strong bond through frequent virtual check-ins and other means of collaboration through social media. If it was not for our army of dedicated volunteers, our business would not exist, and the amount of impact we have allowed to take place through our pro-bono engagements simply would be at the fraction of the level it is currently at. We owe it all to our team! Revenue Streams: How is your work funded? How can it be creatively financed? 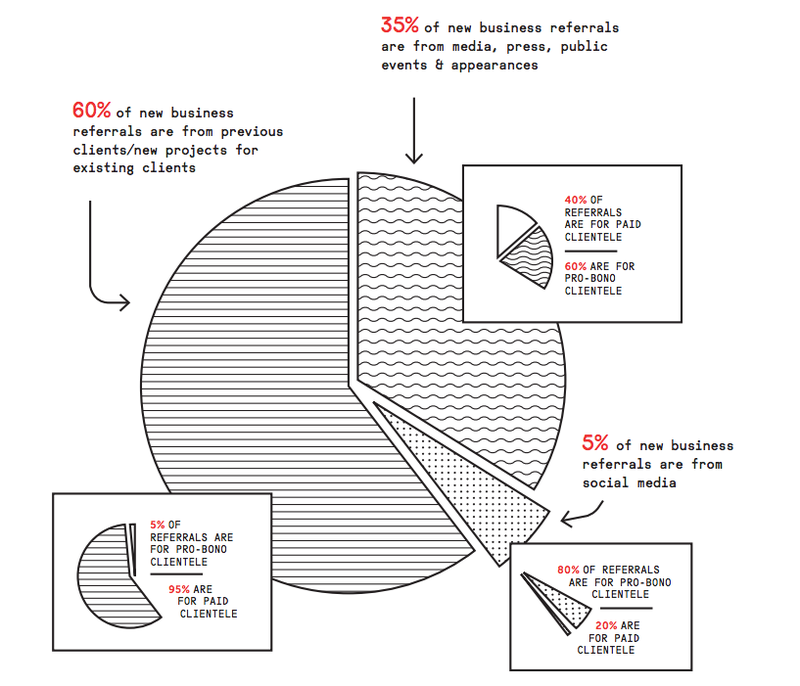 100% of verynice’s revenue that derives from client relationships comes from only 50% of our clientele. verynice has shown a revenue growth of 100% per year for the past 5 years, and has maintained an average profit margin of 65-70%. Alternative revenue sources for verynice include special projects such as books, artwork, workshops / events, and verynice ventures, a series of startup businesses that verynice owns a percentage of profit-share in. Operational Model: Draw your organization chart and show your cost structure. How are you investing in impact? verynice’s 50% pro-bono business model thrives, in part, thanks to a lean and conservative fixed overhead. 75-80% of these monthly costs are allocated towards in-house talent and staff stipends. 15-20% of these monthly expenses are allocated towards studio needs such as office space. 2-5% of these monthly expenses are allocated towards various additional needs such as travel and marketing expenditures. At time of writing, verynice’s organizational chart = 2 managing partners, 4 management staff, 3 production interns.